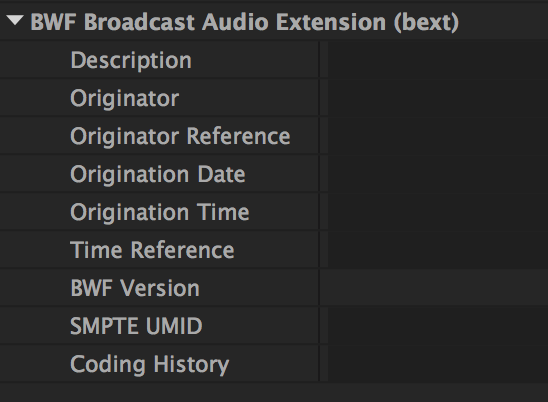 Both iXML and BWF (Broadcast Audio Extension (bext)) metadata standards apply to BWF – Broadcast WAV Files. In fact WAV files can carry many types of metadata, but these two are the most commonly used. The WAV file format is extensible by nature, so anyone is free to add metadata to the format, without breaking the file format. In 1997 the European Broadcast Union published the specification of the Broadcast Wave Format (BWF) for the seamless exchange of audio material between different broadcast environments and between equipment based on different computer platforms. BWF is essentially a WAV file with a Broadcast Audio Extension chunk (Bext) that can store metadata. 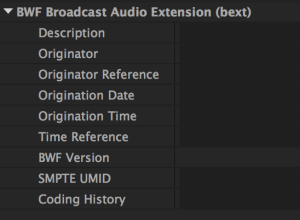 The Broadcast Audio Extension metadata group is available via XMP metadata in Premiere Pro CC. The available BWF Metadata fields. iXML is an XML based metadata format designed for BWF files. It is more flexible than the Broadcast Audio Extension chunk and can hold more information. It was introduced in 2004. You can view more details at The Gallery’s reference site. iXML metadata is read into Final Cut Pro X directly from version 10.3 onwards and using Intelligent Assistance’s Sync-N-Link X for earlier versions. Since version 7 Media Composer offers a WAV/iXML AMA Plug-in for parsing metadata from the WAV files. The Media Composer documentation has details on the specific workflow needed to get iXML metadata into Media Composer because it is different from a direct import.